Rory shares his recent experience at an international conference to talk about RNIB’s new online course teaching literacy through braille. ‘Getting in touch with literacy’ is an American education conference (www.gettingintouchwithliteracy.org) which takes place every two years in different parts of the USA. I was lucky enough to attend the latest conference in November 2015, held in Albuquerque, New Mexico. My reason for attending the conference was to talk about RNIB’s new online course in teaching literacy through braille, which I have helped develop over the last three years. I co-presented with Steve McCall, who drew on his extensive experience of leading the braille strand of the QTVI training course at Birmingham University to write most of the content for the new course. 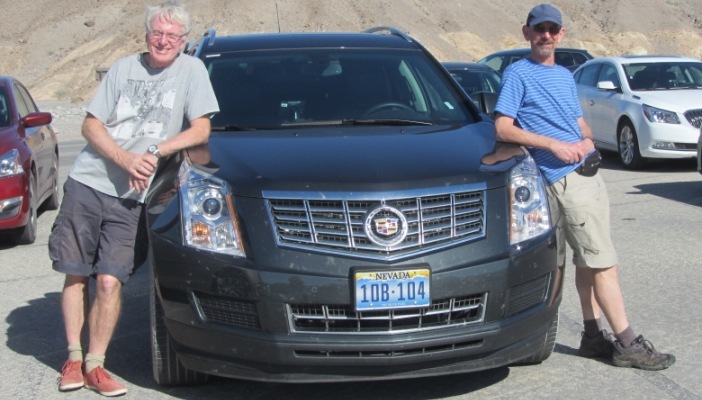 Having decided that Albuquerque was a long way to go for an hour’s talk, we made the conference the final stage of a holiday which started in San Francisco – the photo shows Steve and me looking cool at Zabriskie Point, a remarkable viewpoint in Death Valley. Our aim was to tell people about our braille literacy course in the hope that they might be interested in buying into it or developing their own version for a North American audience. We wrote and developed the course because of the overwhelming evidence that many QTVIs in the UK lack confidence in teaching braille to children. This is largely down to the fact that the number of children and young people learning through braille is always going to be small (currently between1000-1100 in England according to RNIB’s latest figures) and that teaching it requires very specialist skills which many QTVIs get relatively few opportunities to practise. “Altogether I thought it was a great course, I have really enjoyed doing it and feel it has been very beneficial for my work and my confidence working with and promoting braille”. One of the benefits of online training is that it removes many of the geographical barriers to access. To our knowledge, there is no equivalent structured online course aimed at developing the braille teaching skills of QTVIs anywhere in the English speaking world. The course content already draws heavily on materials on the American ‘Paths to Literacy’ website (www.pathstoliteracy.org) and we were confident that it could be as effective for many teachers there. We delivered our presentation to a select group of teacher trainers from across the USA and Canada, and demonstrated key elements of the course to them. There was considerable interest in what we had done and a number of people have since asked for online access to the course website to take a look for themselves. The conference took place in parallel sessions, which meant that over two and a half days there were no fewer than 80 presentations, the majority reporting on research projects relating to literacy for learners with vision impairment. The amount of content in comparison with the UK was sobering. As chair of the annual VIEW conference , I am used to designing a two day programme with around 15 presentations or workshops, which focus on any aspect of vision impairment education, not just literacy. We simply don’t have the research capacity to compare with the USA and Canada, which makes it all the more important that we work collaboratively to strengthen the international content of our knowledge base.